In nearly a week, the spookiest and one of the most beloved holidays, Halloween, will be upon us. While trick or treating may not yet be a custom here in Turkey, celebrating the holiday with blow-out costume parties has certainly become the norm over the past decade. There are dozens of parties being held in Turkey's biggest cities and with the holiday falling on a week-day, this year there is the opportunity to celebrate Halloween all week long. On Thursday, Oct. 25, IF Performance Hall in Ataşehir will be hosting a Halloween Party that includes a free screening of the newest in the horror film series "Halloween" starring Jamie Lee Curtis. Doors open at 8 p.m. and the film will show at 10:30 p.m. Tickets are TL 30 ($5.25), are available on Biletix and include a complimentary drink. On Saturday, Oct. 27, the legendary 360 Istanbul located in the historical Mısır Apartment on İstiklal Avenue will be the venue for party guru Senem Selimi's Halloween costume party dubbed "Drag Me to Hell Halloween." The founder of the "Istanbul Expats & Internationals Group" on Facebook and an avid animal-lover, Senem Selimi hosts themed parties of which the proceeds predominantly go to street animals. There will be a costume contest, DJ Koray Engin performing and a saxophone show by Sofia. Hollywood make-up artist Ezgi Nicole will be doing face makeup while Garage Hair Repair Studio will be doing hair on the night both free of charge. Doors will open at 10:30 p.m. and entrance is TL 50 and includes a complimentary beverage. It is however mandatory that guests register on the Facebook event link to attend. Guests are also advised to bring a business card for a special raffle with lucrative gifts. The James Joyce Irish Pub, conveniently located on Balo Sokak in the heart of Beyoğlu, is a popular hangout for the expat community and regularly hosts roast Sunday dinners, quiz nights and Irish bands. This year the bar will also be holding a "Full Fancy Dress Halloween Party with Live Music" on Saturday, Oct. 27 starting at 7 p.m. Entrance and a drink will be free for those who come in full costume. 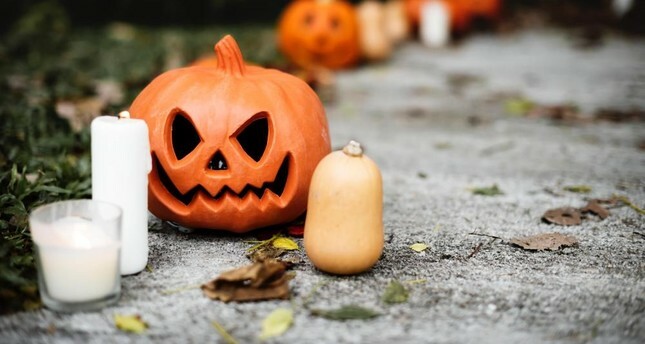 The Italian Cultural Center Circolo Roma, located in Tepebaşı, will be offering a "Halloween Buffet" cooking course and party by Francesca Rosa. Appetizers that are perfect for a Halloween party will be taught at the class which will take place from 10:30 a.m. to 1 p.m. followed by a Halloween party for children from 4 p.m. onward. E-mail Circolo Roma at info@circoloroma for more info. The innovative social game event series Pub Story will be taking place at Uniq in Maslak for a very special Halloween-themed party, titled "Pumpkin in the Forest." Developed by Istanbul locals, Pub Story is a game in which everyone in the venue takes place by taking on tasks given by a mobile app and meeting new people while doing so. Started just a little over a year ago by two Istanbulites, the event series has exploded and is now held in 10 different cities in Turkey. This special Halloween-themed game night will start at 9 p.m. with doors opening at 8 p.m. followed by DJ İlker Aksungar spinning tunes until midnight. Tickets for this event are TL 88 and available on Biletix. One of the biggest events taking place on the night of Halloween in Istanbul will be held at both Klein and Flamme in Harbiye at the same time. Both venues are staples in the electronic music scene and for Halloween, the "Beat the Night" party organization will be bringing out some of Turkey's most popular DJs in the genre such as Nico Sun, Avangart Tabldot, Cüneyt Öztürk, Furkan Kurt and Efe Kantel, Hemi, Jamie S. and Kerem Tekinalp performing. Dressing up in costume is mandatory to attend; however, decorative masks will also be on sale at the door. Available on Mobilet, tickets are TL 77 for general admission and TL 165 for VIP tickets, which will have a specially designated area behind the DJ stage. Another great party taking place will be "Halloween Party Boo2" at the IF Performance Hall in Beşiktaş. The place will be decked out for the event with a "horror tunnel" and three VIP areas devoted to the films "Saw," "Chucky' and "Freddy Krueger." The best, ugliest and scariest costumes will be voted for on Facebook and awarded on the night. Make-up artist Can Özen will be on hand to do guests' make-up and DJs will be spinning tunes from 8 p.m. to 2 a.m. Tickets are TL 20 for general admission and TL 100 for VIP tickets on Biletix. Dorock XL, located in Kadıköy and Beşiktaş, will be decking out both venues with Halloween decorations and frightful surprises for simultaneous parties taking place on both sides of the Bosporus Strait. Awards will be given for "Best Costume," "Scariest Costume" and "Best Couple" and participants will also have the opportunity to select from a number of costume make-up styles which they can have done for free on the premises. Entrance is TL 20 and tickets will be available at the door. Yabangee, the expat community platform and website which informs of ongoing events and hosts a number of them themselves, will also be organizing a fun Halloween party dubbed "Festival of Frights" to take place on the night of Wednesday, Oct. 31. While this will be the sixth year they will be throwing a Halloween party, the venue has not been confirmed. Definitely set to be one of the most popular events among the expat crowd, check the website closer to the day of the event to find out where the party will be taking place. Don't fret, because Halloween is not over in October. On Saturday, Nov. 3, the Istanbul Lindy Hoppers, the city's biggest swing dance community, will be holding a special Halloween costume and dance party that will take place at Harlem in Beyoğlu starting at 8:30 p.m. with an entrance fee of TL 10.